We’d love your help. Let us know what’s wrong with this preview of The Choices We Make by Barbara C. Doyle. We were the initials engraved in the bark of the town willow tree, with the expectation of forever whispering away to the fading tune of an old lullaby, and nothing but broken promises haunting our memories. Six years have passed since Sebastian “Bash” Everly left behind high school sweetheart Opal Anderson to pursue his love of music. With his now world famous rock band, R We were the initials engraved in the bark of the town willow tree, with the expectation of forever whispering away to the fading tune of an old lullaby, and nothing but broken promises haunting our memories. Six years have passed since Sebastian “Bash” Everly left behind high school sweetheart Opal Anderson to pursue his love of music. With his now world famous rock band, Relentless, on break from their continental tour, he returns home to small town USA hoping to win back the girl he left behind. But nothing is the same in Clinton, New York. Old ghosts begin taunting the ex-lovers until their deepest secrets threaten to unravel their very fragile existence, leaving a trail of truth and lies in their wake. While Bash hopes to rekindle what he’d regrettably left behind so many years ago, Opal holds onto the choices they’ve made in the past, letting them determine the fate of their future. To ask other readers questions about The Choices We Make, please sign up. I began this book expecting to be slayed, I thought I had it all figured out but I was pleasantly surprised by the way the storyline went. Good ending. I have never read anything by Barbara C Doyle and I had no idea this was book number 4. I was not lost in the book, so it can be read as a standalone. I would take a chance on this book I love everything about it from the cover to the words written inside. What can I say about this book? I found myself not wanting to put it down. It was hard to go to sleep at night because I wanted to keep reading. Opal, Noah and Bash captured my attention from the get go. The book goes back and forth between time I have never read anything by Barbara C Doyle and I had no idea this was book number 4. I was not lost in the book, so it can be read as a standalone. I would take a chance on this book I love everything about it from the cover to the words written inside. Opal, Noah and Bash captured my attention from the get go. The book goes back and forth between time starting with when Opal met Bash, through the present-day. It is a wonderful story about how our choices make us who we are and how sometimes the choices we make aren't the ones best for us but rather, they are best for the ones we love. I will not elaborate on anything that happens in the book, but I loved it. I felt so many different emotions while reading this book. I was heartbroken several times while reading but I also laughed and smiled. Who wouldn't laugh and smile at a cat in a dress and a cheeky spirited 6 year old? Opal, Noah, and Bash will take you deep in to there past, and pull you so deep in to there now. They will grip your heart. You will feel like you are in the story with them. You will feel every emotion these characters feel. I had moments where I laughed, moment where I had to wipe my tears so I could continue reading. The ending left me with a huge smile. 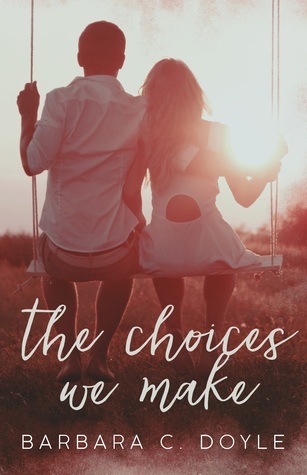 The Choices We Make is a remarkable romance read. So, beautifully written. I wouldn't change a thing. I read this story as part of an anthology and so had no idea it was the 4th book in a series. And you totally don't need to read the other books. This works perfectly well as a standalone. If you aren’t sure if you want Bash and Opal’s story, let me make that decision for you - you do! After reading the stories of the other Relentless members, this one will take the cake! I love everything about this book and it’s characters. I especially love the cameo from Ollie the cat 😉 Who can resist a 20lb cat that gets lost while playing dress up? Certainly not me! Barbara C. Doyle grew up in a small town in Upstate New York, surrounded by a passion for writing, pizza, and cats. Her journey started at the young age of fourteen, and grew as she pursued a degree in English and Journalism throughout college. She believes that the written word is best used as a mode to escape into a different reality, thus the birth of her novels. Her other passions include binge- Barbara C. Doyle grew up in a small town in Upstate New York, surrounded by a passion for writing, pizza, and cats.